LSM-12 FLIPBOX® by POWERBOX - ON SALE! - FREE Shipping! 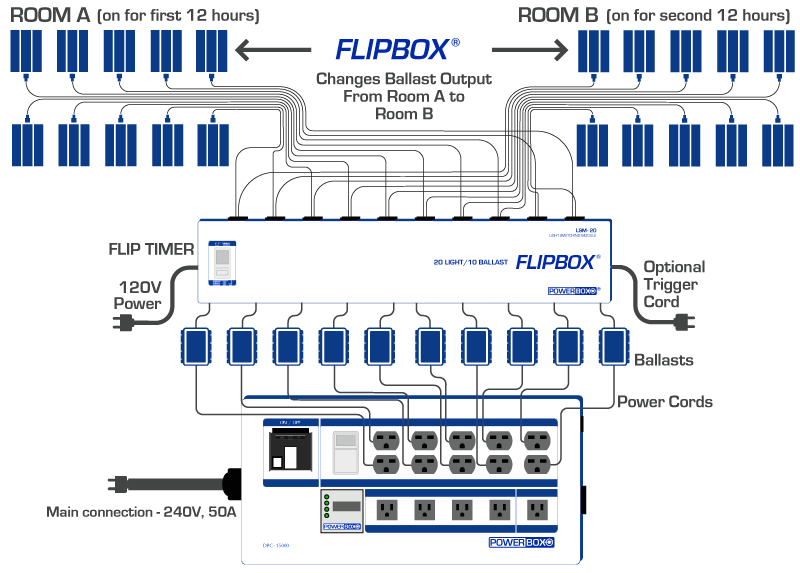 With an LSM-12 FLIPBOX® by POWERBOX®, you can run twelve lights with six ballasts and double your production. The LSM-12 FLIPBOX® is a multi-ballast light switching module that allows each ballast to run two separate lights - one at a time - by switching back and forth between each light, at a user-specified interval that is set on the built-in timer. Designed and manufactured in California from the best industrial-grade components, an LSM-12 FLIPBOX® will instantly bring more productivity to your setup and will provide trouble-free operation. ETL Listed, UL Approved, and CAN/CSA Approved. DOUBLE PRODUCTION of your current setup by completing two 12-hour cycles in each 24-hour day. Run twice the number of lights from each ballast and double your output - all without the expense of bringing in additional power circuits to run more ballasts! SAVE MONEY ON EQUIPMENT. 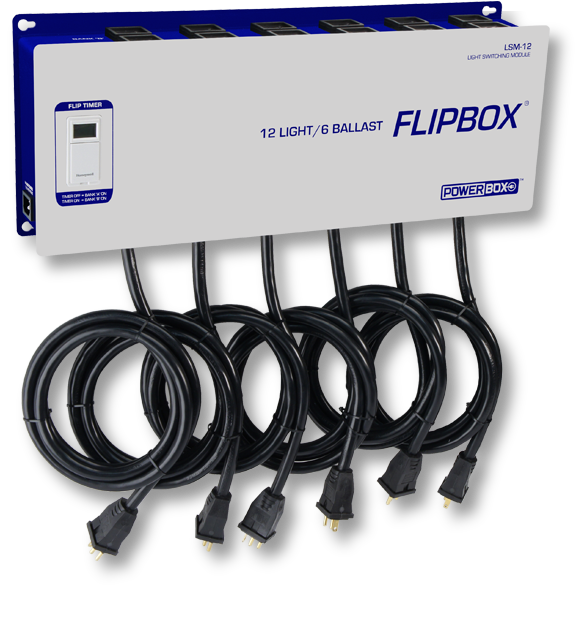 Since a FLIPBOX®allows your ballasts to run double the number of lights, you only need to purchase half the number of ballasts! Compared to the price of new digital ballasts, aFLIPBOX® is up to 70% less expensive. INCREASE YIELD. By using two lights for each ballast in a single area, and switching back and forth between the lights in a checkerboard pattern, the area gets more even coverage and there are no hot spots. Lights can also be closer to the canopy. MAXIMIZE AVAILABLE POWER By running two 12-hour cycles in one day, you are truly maximizing the power you have available to you. You can run double the lights, without having to pay the expense of bringing in new power circuits. Industrial-grade Siemens relays with a dedicated 40A 2-pole relay per ballast. Voltage independent - works with any voltage ballast. Built-in digital timer to control switching cycles. Battery backup to hold timer programs during power outage. Optional 120V trigger cord to can override timer. Works with magnetic and digital ballasts. Heavy-duty cords and receptacles with 14 AWG wire. Sunlight-Supply style plugs & receptacles. Durable powder coated steel enclosure. Non-skid rubber feet for placing on flat surfaces.